Built in 1870, time had taken its toll on the once beautiful chapel on the hill. 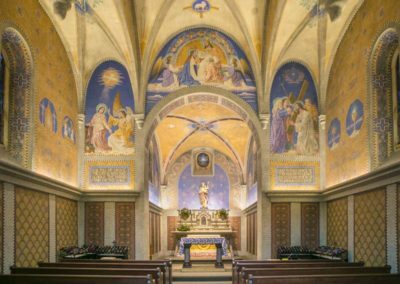 The Shrine was dedicated to Our Lady of Monte Cassino, who is credited with saving the village of St. Meinrad from a smallpox epidemic in 1871. Over the years, areas in the Shrine had been painted over and murals and decoration had deteriorated as the space was not heated or air conditioned. Great care was taken to document the existing condition of the cherished Shrine and identify original patterns that were under layers of paint. Once missing elements were discovered, a sketch was developed and representative samples were provided for approval. Working side by side with other contractors in the space, CSS artists began the conservation of the existing decoration. Murals were carefully cleaned and cracks were filled. A barrier varnish was applied on sound areas to encapsulate and preserve the original paint. Water-damaged areas and previous, poor conservation attempts were in-fill painted. 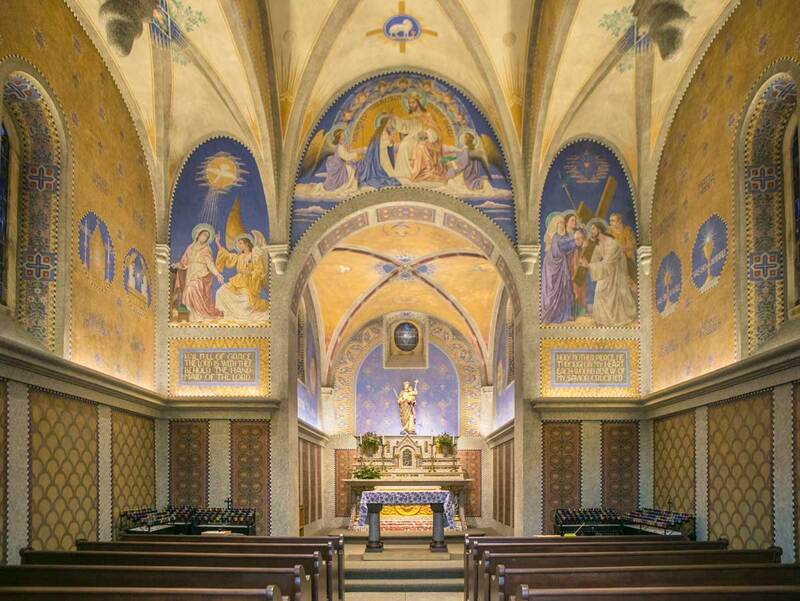 Additional work in the Shrine included the restoration of a statue, the refinishing of the altar and the application of a faux granite finish to conceal new HVAC components. Today, the restored Shrine is a thriving destination of pilgrimage and welcomes thousands of people that offer their prayers and petitions each year.